We looked into the history of the village during World War Two and found that Abberley WI disbanded between 1940 and 1943, because all the available meeting halls were requisitioned for war use. 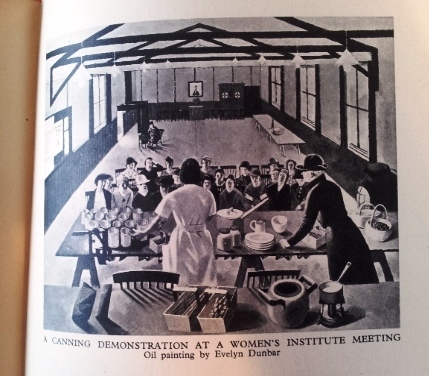 1938: NFWI held WI War Week, when plans were made to organise evacuation at the time of the Munich crisis. Lady Denman was asked by the Minister of Agriculture to become Director of the Women’s Land Army, which she accepted whilst remaining Chairman of the NFWI. 1939: The Produce Guild was formed, with funding from Government, to encourage more home grown food & to preserve more fruit & vegetables. WIs help with evacuation scheme. 1940: The Ministry of Food allocated sugar to NFWI to be distributed to WI Preservation Centres in order to make jam & can produce which would otherwise go to waste. All the produce then went into the nation’s food supply. 1941: NFWI published a report based on a survey carried out amongst WI members who housed evacuees, Town Children through Country Eyes. This stimulated a national debate about support for families ultimately leading to the setting up of family allowances after the war. 1944: WI members helped to make potato baskets for the Ministry of Agriculture & collected herbs for medicinal purposes. 1947: Operation Produce was launched during this year, to encourage WI members to grow more food in their gardens & small holdings, as rationing continued.